The editors of this book examine social movement scholars’ use of contemporary concepts and paradigms in the study of protest as they analyse the extent to which these tools are valid (or not) in very different regional - and thus political or cultural - contexts. The authors posit that ’weakly resourced groups’ are a particularly useful point of departure to evaluate the strengths and weaknesses of three key social movement schools of analysis: resource mobilization, political opportunity structures, and frame analysis. 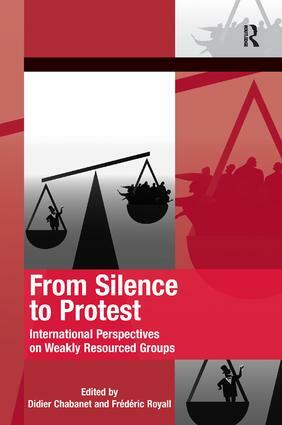 Some of the groups considered in this volume are financially disadvantaged, lacking money and work; others are economically disadvantaged, with members having precarious, part-time, or short-term jobs; some are socially disadvantaged, with fragile networks of solidarity; others are culturally disadvantaged, with members continuously victimized, stigmatized and rejected; finally some are politically disadvantaged when they have little or no access to decision-making structures. These exclusionary factors can be cumulative and give way to different outcomes. The chapters cover a large range of examples including urban riots in France and in Great Britain, the World Social Forums of Dakar and Nairobi, the struggles of precarious workers in Italy and Greece, unemployed mobilization in Germany and Ireland, the mobilization of the Roma and Muslims in Europe, the Brazilian landless movement, the mobilization of small farmers in France, as well as mobilization in authoritarian states such as Morocco and Cuba. This book will be of interest to scholars, students and activists working within social movement studies. Didier Chabanet is senior lecturer at Sciences Po (Cevipof) and Ecole Normale Supérieure de Lyon, Lettres et Sciences Humaines (Triangle), France. Frédéric Royall is senior lecturer at the University of Limerick, Ireland. Together they edited Mobilising Against Marginalisation in Europe (Cambridge Scholars Publishing, 2010). In addition to this Didier Chabanet is co-editor of The Mobilization of the Unemployed in Europe: From Acquiescence to Protest? (Palgrave, 2011) and co-author of European Governance and Democracy: Power and Protest in the EU (Rowman and Littlefield, 2008). Frédéric Royall is author of Contemporary French Cultures And Societies (Peter Lang, 2004) and co-editor of Economic and Political Change in Asia and Europe: Social Movement Analyses (Springer, 2012).